Japanese baking scallop esp. 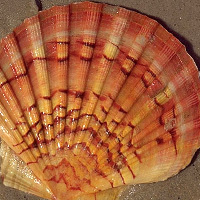 Pectin albicans known as itayagai in Japanese is a bivalve mollusk related to hotate giant ezo scallop that is said to reach sizes of up to 10cm from the center of its uncurved ridge to the arc of its curved ridge. It is found in depths over 40 meters. The calories in Japanese Baking Scallop per 35g(1item peeled) is 21 calories. Japanese Baking Scallop is calculated to be 59Cal per 100 grams making 80Cal equivalent to 135.59g with 3.78g of mostly protein、0.53g of carbohydrates、0.28g of fat in 35g while being rich in vitamins and minerals such as Vitamin B12 and Manganese.